Degradation of organic food for the purpose of releasing energy can occur with or without the participation of oxygen. Hence, respiration can be classified into two types: Aerobic and anaerobic respiration. Aerobic respiration take place in the presence of oxygen and the respiratory substrate gets completely oxidised to carbon dioxide and water as end products. This is often used as a synonym of respiration. 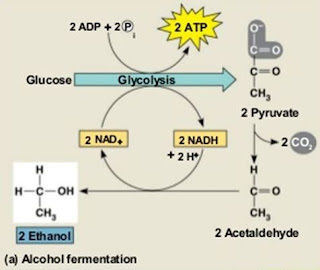 Anaerobic respiration: It is an energy releasing stepwise incomplete catabolic breakdown of food materials without employing oxygen as an oxidant. Some other compounds are also formed in addition to carbon dioxide. This type of respiration is of rare occurrence but common among microorganisms like yeasts. Fermentation: It is an anaerobic breakdown of carbohydrate and other organic substances with the help of microorganisms or their enzymes. It is a special type of respiration in which organic compounds serve as both the electron donors and the terminal acceptors. Pasteur defined fermentation as life without air. Pyruvic acid is the raw material for fermentation. It is obtained from glycolysis. The end products are alcohol, lactic acid, formic acid, acetic acid. Fermentation is employed by human beings to obtain alcohol and other chemicals. It is mostly an extra cellular process. A small quantity of oxygen rather stimulates activity. The substrate and end products belong to the anaerobically respiring cell. The substrate is obtained from extra cellular medium and the products are also passed to the outside. Enzyme extracted from the cells cannot perform this type of respiration.